Sampling of hatchery fish caught while drift fishing. With over 35 years of drift fishing experience I am still learning new tricks to put more fish on the beach. Drift fishing is the most flexible method of fishing for steelhead, but one of the toughest to master. You must have the right equipment, be able to read fish holding water, detect the bite lightest of bites and set the hook before the fish spits out the bait. Bouncing a piece of lead (slinky or pencil lead) along the bottom of a stream and then detecting the difference between a fish bite and the bottom. Seem simple enough? Its not when you didn't get a bite all day or did you? Fishing poles needs to be sensitive enough to feel every grain of sand, yet strong enough to set the hook with 40 yards of line across the current. This is the most important piece of the of equipment you will buy and the most expensive (besides a boat). My standard rod is 8.5' long and rated for 8-17lb line with a baitcasting style reel. When I side drift out of my jet sled I switch to a longer rod with lighter line equipped with a spinning reel so I can cast the light lures farther (boon dog setup). Reels are a very important part of the puzzle. Your reel should be matched to the pole you will be using. Most common reels use for steelhead drift fishing are bait casting reels (also called level winds). It takes a little getting use to casting a level wind, but once mastered it provides the best form of control for drift fishing. It also allows you to free spool under control, which increases the time your lure spends in the strike zone. I personally recommend Shimano, Ambassaduer and old Pflueger Supreme bait casting reels (thumb drag). Spinning reels can be used, but are very awkward in all aspects of drift fishing, Best used for other styles of fishing while casting light lures, boon dogging and for float fishing with jigs. Center pin reels are used primarily in Canada for float/dink fishing. These reels are single action and your palm is used as the drag system. Not for beginners but are a art in themselves to use properly. type of line (monofilament, braided)......braided lines can cut into the metal of a reel (newer reels are using titanium for the new lines). The line you use should match the rod, reel and the conditions you will be fishing. The clearer the water the lighter the line you should use. Michigan steelheaders use line as light as 2 lb test. 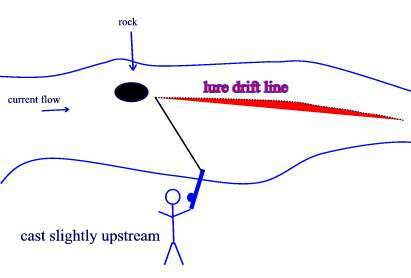 I commonly use twenty pound line because the rivers I fish are colored, brushy and full of rocks. 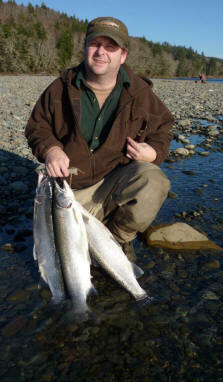 Cowlitz anglers commonly use 8-10 line and 4 ft leaders while side drifting thumbnail sized cluster eggs or tiny corkies. This is were the art of steelhead fishing comes into play. Your bait should match the conditions you are fishing. Can the fish see the lure?, Will it spook the fish?, What color do I need to use? Should I use bait? Common lures are the Corkies, spin & glow's, cheaters, okies, or something that imitates these standards. Lures come in the colors of the rainbow and every fisherman has their favorite color. They also come with various wiggles, spins and wobbles. Size is also a consideration for your lure presentation. Once you understand the special features you want from a lure, you can match your lure to the conditions. If you can't find a commercial lure to match your needs, you can custom paint lures to meet them. A steelhead has a excellent sense of smell. When the water is so stained you can't see in two inches into the water, the steelhead can find your bait by movement and smell. 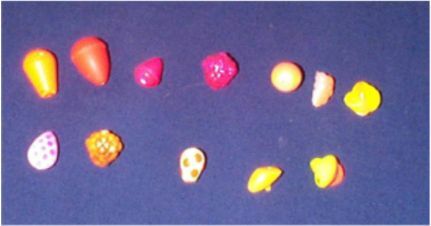 Common baits are sand shrimp, eggs, night crawlers and sea shrimp fished behind a corkie or cheater. Barrel Swivels are used to attach a lighter leader to a heavier main line. This allows you to quickly adjust your rig to water conditions & minimize mainline loss to snags. Your hooks should match the type of lure and bait your using. They should always be sharp for easy penetration. Hooks need to be strong enough to hold a running fish without bending out, and point rollovers from rock encounters. Some areas require barbless single hooks (watch your regulations). You have a better chance of getting a solid fish hookup if you are using double hooks that are pointing in opposite directions. You should check to see if your hooks are sharp after your bait hangs up. Carry a point file with you to freshen up the point. In heavy current fish can often hook themselves when your hooks are sharp. Let me start by saying there are numerous ways of hooking up your lead for steelhead fishing. While fishing over the years I have snagged out of the river just about every possible way to rig gear. To help prevent line twists and bottom hang ups. Make sure the lead is straight or it will spin in the current. If you don't have a plunking sinker with you on the river, take your pencil lead and bend it into a C shape. So keep it straight your not plunking your drift fishing. Pencil lead is the most common and economical type of lead used for drift fishing. Pencil lead comes in various diameters 1/8, 3/16 , 1/4 inch. There are times when I would use 1/2 if they made it. Pencil lead also comes in hollow core and solid. 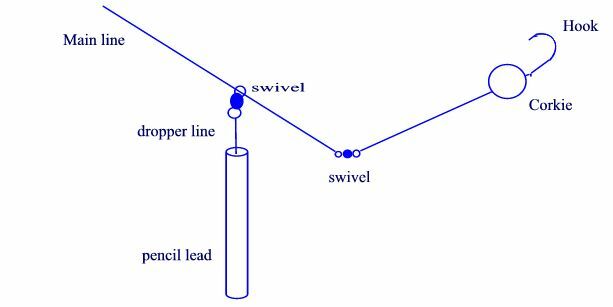 Depending on the way your rigging your lead set up will determine the type of pencil lead you should buy. Another type of lead is called a slinky. A slinky is a bunch of split shot weights incased in a piece of parachute cord. This allows the lead to bend around rocks with out getting hung up quite as often. A slinky doesn't send back as crisp of a bottom feel as straight lead because of the flexibility of the cord. You also can't adjust the size of the slinky with your pliers if you have to much weight. If you want a slinky with good bottom feel make them out of surgical tubing filled with lead shot. Stationary leads are used to get baits down quickly in fast current. A sliding lead set up has many advantages over stationary lead while drift fishing. It makes bite detection easier to detect. Longer time for the fisherman to react to the strike. A sliding lead takes slack out of line by its very nature. . A tight line keeps the hook points stuck in fishes mouth until you strike (not embedded until hook set). A stationary lead can introduce slack between the lead and fish when a fish strikes, causing you not to feel the strike. Leaders should be tied at home and stored in a case/ dispenser. (I use a Pip's Leader dispenser). Your leaders should be a little lighter test than your mainline. You can use the same leader strength as your mainline, but risk breaking off your main line close to your pole (ending your day until you refill your reel with fresh line). You should check for rough spots in your leader often, since it is in, on, and around rocks constantly. If you have a rough spot change your leader immediately!!!! Don't forget to check your mainline for knicks and wear near your sliding weight. Your leader should never be shorter than twelve inches in length and preferably 16-18 inches long. 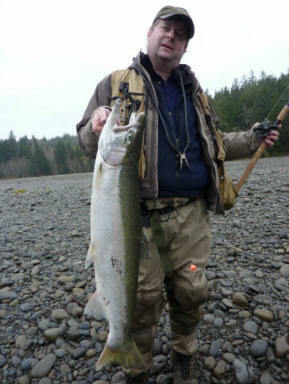 Cowlitz river anglers use a 4 ft leader while side drifting (boon doggin). Signup to our bulletin board forums for more information and tips.